Our online training course Crowdfunding to Win – hosted on Udemy has hundreds fo satisfied users. Perfect preparation for any type of crowdfunding campaign it is a cost-effective and universally accessible resource licensed and used by many business support agencies but also accessible to you. Sign me up! Short or in-depth practical sessions for those thinking about, or ready to, crowdfund. These sessions set out the key decisions and common pitfalls, with comprehensive planning and preparation tools and exercises. One to One coaching and mentoring delivered by phone, skype or face to face offering analysis, insight, planning and tips to make your project a success. Bespoke sessions demystifying and explaining in simple terms what crowdfunding is, how it works and why it matters. Custom resource development including brochures, guides, analysis, reports, articles and blog posts bespoked and localised to the specific needs of the client. Analysis, evaluation and preparation services to support and develop individual crowdfunding campaigns. Provides gap analysis, preparedness assessment and success probability services. 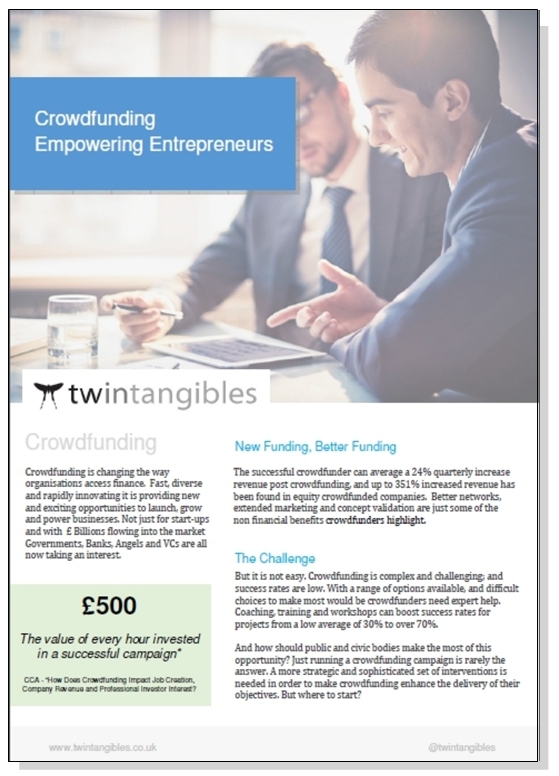 Many Governmental, public and civic bodies are recognising crowdfunding is an exciting opportunity that can help them deliver real and measurable outcomes for their aims. But many struggle to formulate effective strategic interventions to help and support their stakeholders make use of this opportunity beyond simply the idea of running a crowdfund. Our Intervention Framework underpins our consultancy services in this area and its use opens out a much broader, deeper and more deliverable set of interventions. It has been used by clients like the European Commission, Councils, charities and Governments to find the most effective and appropriate mechanism to deliver value and impact through the opportunity of crowdfunding. Based on four pillars of Matching, Education, Leverage and Infrastructure it is a robust and repeatable framework.